for my baby shower! My invitation came in the mail this week and it is so beautiful that it's going right into a picture frame! My cousin's wife, Alyssa, made them all by hand! It's absolutey perfect. 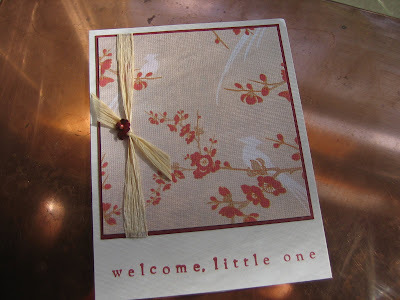 I loved the "invitation" too...it is beautiful and I am thrilled to be a part of Poppy's Shower!! Love this site....so neat to be able to follow your family's journey - you will all be together soon. I think Poppy's room is fantastic -"it" certainly has character. I will be watching for the finished product.